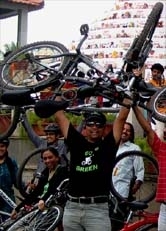 April-09 Critical Mass(25-apr-09) - GGI-Group size: 4000+ Professionals, Increasing on day to day basis, Come & join us 2 serve Mother Nature. As usual, We planned to meet @ Cafe Coffee day between by 3:30 - 3:45pm, Sunil,Shwetank & Kavinder turned up on time myself and Vijay reached at 3:45pm, We waited for Mahesha & Amit Finally Mahesha arrived @ 3:55pm & Amit by 4:00pm meanwhile Rajaram called to inform he would meet us @ 4th Blk Jaynagar. 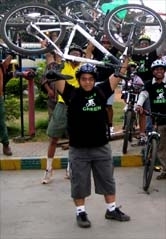 We all strated @ 4:00pm and on the way pickedup Rajaram then headed towards Lalbagh rear gate where Jaleel,Shreeram & his friend were waiting further on the double road Sejal was waiting from 3:50pm finaly she too joined and reached Cubbon Park by 4:30pm. 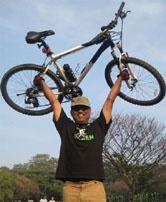 Hari had decided to meet us @ Cubbon Park and he reached @ 4:10pm but was able to make out the place by 4:35pm. Many of them didn't turn up due to weather condition. Most of them presumed to be raining heavely hence 40 cyclist turned up. This time we decided to head towards Kormangala's National Games Village. Jaynagar 4th Block - Jnagar 3rd block - Devi Showroom (Mahadevan park circle)- Ashok Pillar-Siddhiaya Road - Lalbgh rear geate - Lalbagh front Gate - Double road - Right under flyover - lavell Road - Jewels De paradaise - Cubbon park - B'lore press Club - GPO - Vidhan Sabha - UVCE Colleage - Hudson Circle - towards Indoor Stadium - Jewel De Paradase - MG Road - Brigade Road - Residency Road - Garuda Mall - headed towards National Games Village through Richmond Road - ViveakNagar - National Games Village - NDDB - Kormangala 5th Block playground. Enclosed below r few Snaps from my camera shared on Picasa Web Albums.